St. Francis spoke of this, now Pope Francis re-iterates this from the Southern Hemisphere. The Seeds of Light are falling on good and virgin soil of a Lion's heart, and can thus bring into creative expression and manifestation the yearnings of a tired humanity. When you act from the heart, your heart-center, with the intention and power of the Word, Your Word, you bring forth the Wor(l)d of the miracle of the essence of You, your divine capacity for creativity and authentic expression. Ask and you shall receive, knock and it shall be answered, seek and ye shall find. You are learning to do this now with great purpose and focus and precision of Heart-thought. You come now to a point of decision. Of knowing that your course is inner-directed, that the waiting for externals to move your creative passions is fast coming to a halt, that we are moving to Divine Origination of the Architecting of latent possibilities contained within our genetic seed. And these seeds are now awakening, we are being given the chance to prove to ourselves levels of Mastery we could not ascertain/certain/attain before. 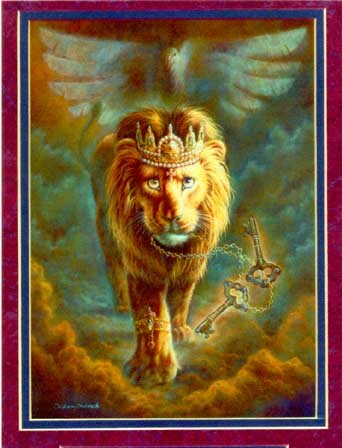 Those holding the Golden Lion Courage Codes:: in charge of the Solar/Soular Emanation shall be able to plant resonance in VirginSoul/Soil, in NewLand,TerraNova,free from the obstructions of the past de-graded [read: manipulated] codings. You are "light amplificating" Now. We are entering a kind of "spiritual De-Militarized Zone" a kind of buffer zone, a "render harmless" zone, the 45'angle of neither horizontal nor vertical, but Diagonal. Hence the keywords are :: both, and, inclusion, triality, Trinitarian Consciousness, triune. Think "trine" flow, grace, ease, win/win. ::Golden Lotus Heart::desires, for you have learned to master the Architecturing of Form in this stratification of density. There needed be long periods of integration and alignment and soul and interdimensional and karmic clearing. You have held grid templature for many eons, and have acted as rehabilitation Brothers and Sisters for those who carried the lower frequencies of the Love/Light Continuum Spectrum. At the NOW moment, the avenue of safety is being reached, the Ring-pass-not(9)(knot) and you shall be freed of the encroachment of all who have not done their requisite clearing ~ for the clearing you HAVE done changes your physics, dear Ones, and your physicalities, you are no longer vibratorily resonant with the lower enmeshment "hooks" and thus can pass over them, your "radio signal" will no longer receive static from that station. This is a Grand Time and adventure of Golden::Lighted:: opportunity for you, and, you have created it because you wished it to Be So!! The nature of your personal light, your expression, your actional ways in the world, wor(l)d have changed. Your relation to your words has changed, you are realizing you become your word, your word becomes your wor(l)d. Such is the power of creation. Such is the responsibility of manifestation. What you posit, you put forth, into the aethers physicalizes its expression almost instantaneously now. The nature of how you see yourselves as a Species is fast coming to a close. This is both a final chapter and a NewBeginning. For the Script is now gone.You are the Genesis now, you are the Nexus of your own Next Steps of Creation.